I told you not to eat your dahlia tubers. Now I have to eat my words. It didn’t take much searching to come up with another site that touts dahlias as both beautiful and edible. In addition to the petals (and just imagine the great look the spicy-sweet petals of your favorite dahlia will add to your summer salads!) the roots are edible; some are even tasty, according to writer William Woys Weaver. 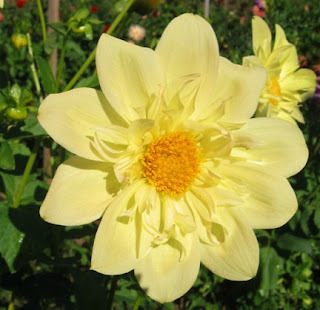 His article in Mother Earth News points out that as a relative of sunflowers and Jerusalem artichokes, dahlias have lots of potential for the table. However, it’s the older, less showy varieties that taste best, he says. Flavors, according to Weaver, range from spicy apple to carrot, though some are “quite bland.” He recommends peeling, dicing and parboiling them for five minutes with diced carrots as the basis for a salad in a homemade mayonnaise base. Well, it’s something to do with the extra tubers without eyes left over when you divide your thriving dahlias. At this point, all I’m going to eat is my words. Dahlia Pests: Just Think Escargot!